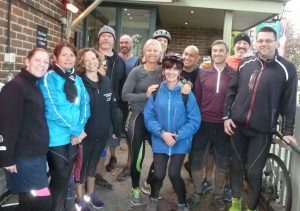 A GROUP of exercise enthusiasts who meet in Horsell and Goldsworth Park have raised more than £1,000 for Woking Hospice by taking part in a 50-mile trip to and from Richmond Park, southwest London. Fifteen members of Scorpion Training Bootcamp, which meets at the at Wheatsheaf Common on Saturday and Sunday mornings and Goldsworth Park Recreation Ground on Friday mornings and weekday eveni ngs, took part in the sponsored event. The other 13 cyclists had continued and gave Jane and Richard a rousing cheer when they made it back to the Common. To add to the Scorpion Training Bootcamp donation to Woking Hospice, visit www.justgiving.com/fundraising/Scorpionbootcamp.